The definition of success for hosting major sporting events is changing. Fiscal, social and, as of late, environmental responsibility are making a comeback as cities are being more judicious than in recent decades about spending on bids and doing a better job at identifying local strengths (and weaknesses) to target events that make sense for them. After incorporating sustainability criteria and best practices into the 2018 NCAA Women’s Final Four, the Columbus (Ohio) Local Organizing Committee (CLOC) earned the prestigious “Evergreen” certification from the Council for Responsible Sport (read the press release here), which offers a framework of best practices for holistic social and environmental responsibility at events. While the 2016 and 2017 NCAA Men’s Final Fours earned certifications in Houston and Phoenix respectively, Columbus has become the first NCAA Women’s Final Four host city to be certified. The tournament generated over $21 million in direct local spending. 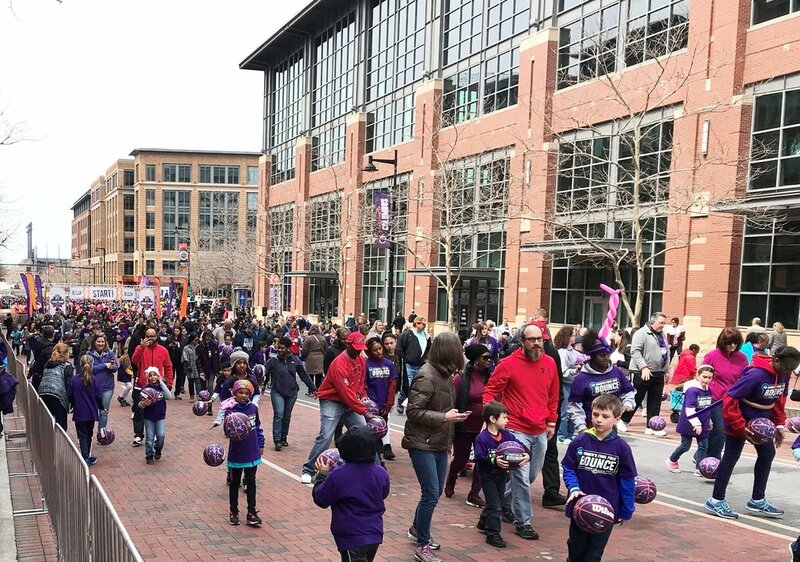 According to an economic impact study, the weekend event at the end of March drew nearly 20,000 visitors to the city and accounted for 32,000 hotel-room nights (AP). And while this level of impact was a key objective of organizers from early on, it was not the only driving objective. Robust community and youth programming and responsible resource management were also made top priorities. Two of the leaders that played key roles in the beyond-the-bottom-line success of this year’s Women’s Final Four, Michelle Perry (CLOC Executive Director) and Christy Cook (LeanPath, CLOC sustainability committee chair) recently debriefed the event with the Council’s managing director, Shelley Villalobos, talking about how they set up for success, and why they chose the projects and partnerships they did. SV: Thanks for taking some time ladies. Could you start by sharing about how you set up for success internally within the local organizing committee? MP: Sure. The question warrants a bit of history about bringing the Women’s Final Four to Columbus in the first place. This journey started about ten years ago. Columbus put in a bid in 2008 which was unsuccessful because the tools and resources needed to make it happen didn’t exist at the level the NCAA expected at that time. It turned out to be a blessing because it highlighted those gaps and catalyzed several things to fill them. Namely, a few new downtown hotels were built, and the Columbus Convention Center was expanded. When we bid again in 2013-14, the package looked very different. We were awarded the bid in 2014 to host the 2018 NCAA Women’s Final Four and we began to pull our team together about two years prior to the event to formulate our strategy. We visited the event in Indianapolis in 2016 with a team of twenty people and attended again in Dallas in 2017. The team agreed that those experiences were instrumental to our education. It’s one thing to read an after-action report and it’s an entirely different one to see it all in live action. We knew we wanted operations to go beyond the games themselves, and to provide a platform to involve as many people in the Columbus area to the extent that they wanted to engage. We identified community leaders to plug in, like Christy with the sustainability focus, to take our expectations and to refine and implement them. CC: From a sustainability standpoint, we really got going around July of 2017. Our approach was to look to the overarching objectives the committee had set for the event, and to see how our team and partners’ strengths and interests could complement and contribute to those. Previous iterations of a professional development platform dubbed ‘Beyond the Baseline’ have been driven by the NCAA. In Columbus, organizers envisioned an ongoing channel to host community dialogues on relevant issues. The CLOC requested and was approved to use the ‘Beyond the Baseline’ brand to host monthly programming beginning in October 2017 and culminating with the WFF weekend in late March. SV: What was the vision and purpose behind Columbus’ version of ‘Beyond the Baseline’? MP: We looked at Beyond the Baseline to engage a broad-based audience within the Columbus community. One of the valuable byproducts of turning it into a monthly event-based program was to expand our circle. We partnered with women-led or women-focused organizations that would help share the programming with their networks and use the platform to speak to issues relevant to them. For example, we partnered with Women’s Fund to have a serious conversation about gender bias, an important topic that they are tackling directly through their work. They helped us craft the event and create a sports focus. Last December we focused on ‘Giving Back’ and got together the CEOs of the local United Way, YWCA, Columbus Girl Scouts and Columbus Young Professionals for a panel discussion moderated by Yvette McGee Brown, a State of Ohio Supreme Court Justice. The feedback was incredibly positive, and we had community leaders walk in and say, ‘I don’t know everyone in this room’ which was great because we got to introduce a lot of people to one another. 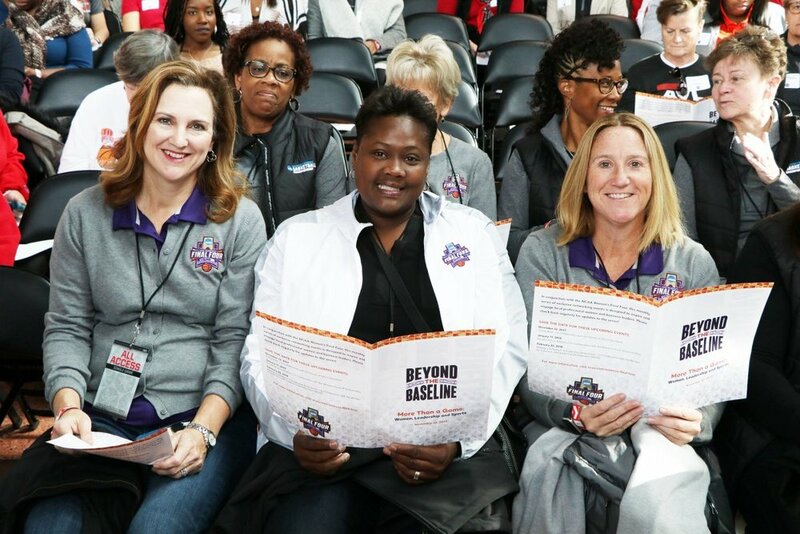 When NCAA Women’s Final Four weekend came, they [NCAA] brought in some national speakers that related to a variety of audiences and we saw great turnout, hopefully in part because we had familiarized the community with the program for several months by then. SV: The Council for Responsible Sport certification framework relies on a ‘triple bottom line’ definition of sustainability—that is, weighing the impacts of actions on people, the planet and profits, instead of primarily just the latter. Let’s talk about the ways the CLOC activated on the side of people in addition to ‘Beyond the Baseline’. MP: Sure. A program called ‘Read to the Final Four’, a youth ‘Bounce’, and a youth sport court restoration project are three ‘built-in’ programs the NCAA supports around both the Men and Women’s Final Fours. I think the Bounce was perhaps the most engaging for youth. It was a free event for kids to dribble basketballs through downtown Columbus and they got a t-shirt and a basketball. We had 2,700 kids register and participate, which was very close to what the hosts of the Men’s Final Four see. It was really encouraging to see the community embrace the Women’s Final Four with the same level of enthusiasm as for the men’s tournament. Also, 2,500 kids started measuring their time reading after winter break, and we measured a significant increase in minutes read by our local third graders in the months leading up to the event. We partnered with Second and Seven, a local non-profit started by a former Ohio State Football Player and his wife, focused on youth reading. Participating students got a sneak peak of Tourney Town (fan interactive) on Thursday before it opened to the public, and we had an awards ceremony to recognize the kids for their reading, helping reinforce to them that reading success is something worth celebrating. We got lots of positive feedback from the school district, teachers, kids and their parents. We were also able to secure some extra funding to contribute to Second and Seven to help support their important work. CC: Then there was the gear collection. It was the first time the Greater Columbus Sports Commission did one and we all really liked the idea. We spoke with local school athletic directors to understand what kind of gear they needed then identified key locations to place collection bins. We did a weekly pickup and delivery to Columbus schools and ultimately redistributed over 300 pounds of lightly used gear to young athletes in Columbus. SV: The word ‘legacy’ is used a lot when it comes to hosting major events. How did the CLOC look at the idea of legacy and what results did you see? CC: For the sustainability committee, we saw planting trees as a great way to make a positive contribution to Columbus as a place. We knew about Columbus’ city wide goal to plant 300,000 urban trees by 2020, and thought that was a great way to make sure we could look back and say “those came from when we hosted Women’s Final Four”. Sequestering carbon, which trees do naturally, was another important link to recognize the fact that the event has climate impacts. We had a local class come out and plant the trees at one of the planting events and were able to make the scientific connection with them. They were excited! Most of them had never planted a tree before, and it was evident that they were proud to have made Columbus a little better. We’re thrilled to also have had the opportunity to contribute funding for additional trees to the Branch Out effort as another aspect of taking that legacy a little further. Another tangible example is that the convention center has permanently added more recycling containers to their facility. We’re confident that sustainability has just become more of conversation amongst all the partners, and in many ways going through the Council for Responsible Sport certification was a roadmap for us and put some things on our radar that will continue to be discussed for future events. SV: Thanks ladies, for the time and insights, and for the successful effort you all put into hosting an awesome NCAA Women’s Final Four in Columbus. Networks are a key aspect of how things get done. To convene and introduce people is to foster progress toward community goals. Subtext: are all members of the event delivery team and its partners informed of the key social, environmental and economic goals in the host city? If you’re interested in learning more about how to work collaboratively to host more responsible events in your community, be sure to check out the Responsible Event Framework, a project generously supported by the Urban Sustainability Directors Network and delivered by the City of Eugene and the Council for Responsible Sport. If you're ready to take on the event standard for responsible sport, or just learn more about certification, contact us to get the conversation started.